Walking, cycling and scooting to nursery and school has many benefits. It reduces the number of cars on the road at peak times of the day and reduces parking problems outside our schools. It also gives children (and carers) a valuable opportunity for physical activity. Aims and objectives setting out what you want to achieve. Identified champions to help promote the travel plan (pupils, staff and even parents and carers). A baseline against which you can measure progress (such as Hands up Survey data). Roles and responsibilities of individuals and organisations who will help deliver your Travel Plan. Actions to take forward in the short term and medium to long term (such as taking part in events and campaigns, working with the Council on parking issues outside your school, securing cycle or scooter parking). A travel plan does not need to be a lengthy, onerous document - the shorter the better. It is also important to keep it updated, and to communicate it to everyone who has a role to play in delivering it - pupils, staff, carers, the Council, Police Scotland and others. Pupils should be involved in its development if possible. Sustrans have developed a six-week guide to increasing walking, cycling and scooting to school, Increasing active travel to school. Information on how to prepare a School Travel Plan, including a template and list of useful contacts, is available to schools via the council's intranet. Since 2008, Sustrans and Scottish local authorities have been carrying out an annual Hands Up Survey in nurseries, primary and secondary schools. Schools across Scotland complete the survey by asking their pupils 'How do you normally travel to school?'. The survey takes place in September each year, and results are published around May of the following year. The Hands Up Survey is a valuable source of data for school travel plans. It is also important for monitoring progress on how schools, local authorities and the Scottish Government are doing on supporting smarter travel choices to school and nursery. The latest set of summary results for 2015 are available at Sustrans Hands Up Scotland Survey. Schools and nurseries have access to their results. Bikeability Scotland is a cycle training scheme designed to give children the skills and confidence they need both to cycle safely on the roads, and to encourage them to carry on cycling into adulthood. For more information on the scheme, head to Bikeability Scotland. The delivery of Bikeability to pupils in schools depends on staff, carers and local volunteers. On behalf of Cycling Scotland, the Low Port Centre provides free, one-day Cycle Training Assistant courses to those who are committed to help deliver cycle training in West Lothian schools. This course allows the trainer to deliver Bikeability Levels 1 and 2, typically aimed at primary school pupils. A four-day course, Cycle Trainer, is also available to those who wish to teach Bikeability Level 3 (typically for secondary school pupils). Scheduled courses are listed at Local cycle training courses. For more information on Bikeability and Low Port Centre cycle training courses, contact the Low Port Centre on 01506 775390, lowport@westlothianleisure.com or visit Low Port Centre. Part-funding for cycle and scooter parking at schools is available from Sustrans annually. Applications must be made via the local authority and information on the funding rounds are sent to all schools each year. More information is available at Sustrans funding for schools. Meldrum Primary School was a recipient of a Glasgow Commonwealth Games Legacy cycle stand in 2015. Medal-winning gymnast, Adam Cox, nominated the school to receive the cycle stand. If your school or nursery is in need of cycle or scooter parking, contact the Council who will try to assist you, subject to the availability of funding. Most schools in West Lothian have a road safety coordinator and at least two Junior Road Safety Officers (JRSOs). Their role is to help promote road safety initiatives both in school and in the local community. They attend an induction meeting each session where they are introduced to the JRSO website and its resources, which include games and a section for uploading the work of the school. For more information on the JRSO scheme, visit JRSO - All Together for Road Safety. There are many opportunities to take part in national campaigns, events and award programmes to support smarter travel choices at your school. Cycling Scotland runs a Cycle Friendly School award programme. Their purpose is to help you promote cycling locally and our schools more cycle-friendly. To date, six primary schools and two secondary schools have been awarded the Cycle Friendly School Award in West Lothian with more in the application stages. For more information on the Cycle Friendly School awards for primary and secondary schools, visit Cycle Friendly School award. Give everyone cycle space 2015West Lothian Council is a partner in Cycling Scotland's Give Everyone Cycle Space campaign for 2015 and 2016. This campaign aims to create high levels of driver awareness around people on bikes to make Scotland's roads more cycle friendly. 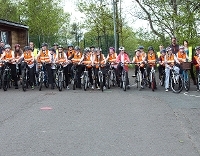 As part of the West Lothian campaign, over 75 pupils and staff from Dedridge, Bankton and Williamston Primary Schools, and James Young High School, took part in led cycle rides in May 2015. If you are a driver, give cyclists space - as much as space as you would give a car. Visit Give Everyone Cycle Space for more details. The Big Pedal is the UK's largest inter-school cycling and scooting challenge, run by Sustrans and The Bike Hub. Schools compete to see who can record the greatest number of bicycle and scooter journeys over three weeks. All schools (with a SEED number) can apply to take part. A number of West Lothian schools took part in the Big Pedal in 2016 - it's a great way to promote cycling and scooting at your school. Head to The Big Pedal for more information. Living Streets offers a range of resources and campaigns to help your school promote walking. These include the Walk once a Week (WoW) scheme, Walk to School week, and the Travel Tracker - a web-based tool using the classroom whiteboard to record and promote walking to school. Visit Living Streets walk to school for more information. Sustrans have created a useful guide "5 small steps to something BIG" to help schools and nurseries make every week a walking, cycling and scooting to school week. For more information and to access useful resources, visit Sustrans Bike to School Week. West Lothian Council runs its own Walking Week every September. A number of activities are planned to encourage all residents to get out and walk. A themed walk is also promoted to schools. More details on Active West Lothian. Cycling clubs attached to schools are growing in number. They are a mechanism for increasing the profile of cycling in your school as a sport and as an everyday method of travel. They can help enhance cycling skills and confidence alongside Bikeability. The provision of cycling clubs can also help secondary schools apply for the Cycle Friendly School award. Scottish Cycling run a Go Ride initiative which offers support to schools wishing to set up a cycling club. For more information, visit Scottish Cycling Go Ride.